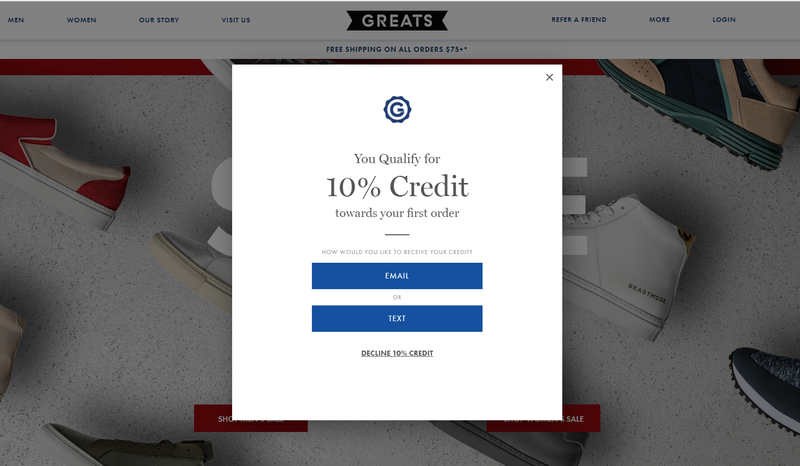 In the past few years, Shopify popups have become a standard. To prepare this selection, we reviewed 218 Shopify stores. About 40% of them used popups or bars, most of them displayed on landing. The Shopify App Store further attests this popularity. It features almost 50 different popup apps. But not all popups were created equal. 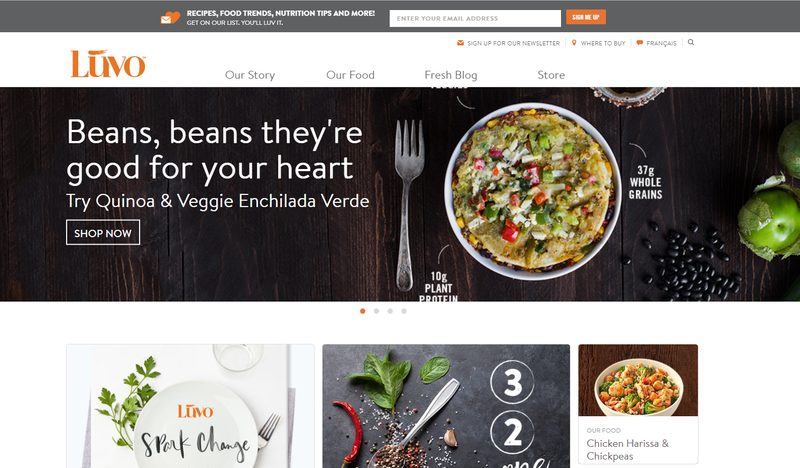 Our research made us realize that a lot of Shopify stores, even established brands, still use popups that are not optimized for conversions. Some ask for too many details (see the example below), a lot don’t reward subscribers, and most of them use very basic targeting. Let’s see how you can do better! 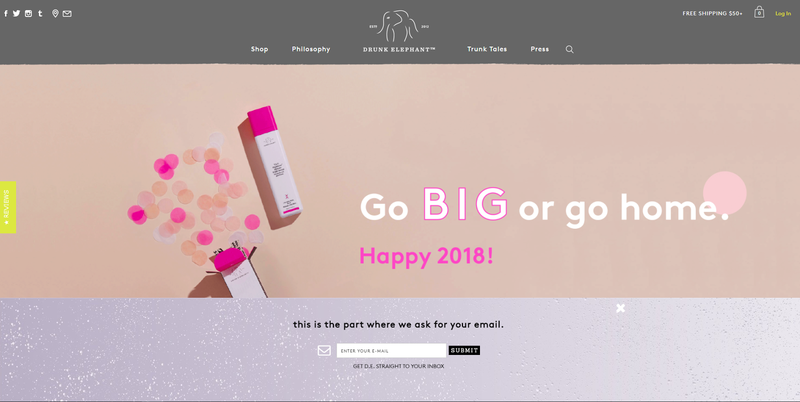 Let’s start with the best examples of newsletter popups and see what they can teach you about list-building for Shopify stores. Plus it’s simple; anyone could design this kind of popup. Let’s state the obvious: this popup design could be vastly improved. 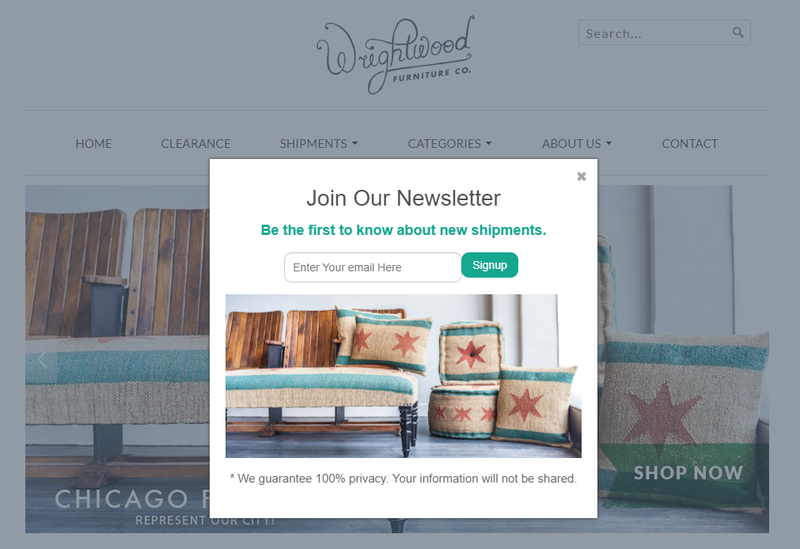 They mention a convincing reason to join the newsletter (you may not be aware of new shipments if you don’t sign up today). They state clearly that the subscriber’s data won’t be shared. At a time when Internet users are increasingly concerned with their data privacy, it’s a good precaution. Does your popup need visuals? Not necessarily, as this example proves.The colors are stunning, contrast with the background (making the popup more visible) and match the website color theme. Plus, as it doesn’t include any pictures, it loads super fast (which is important to take into account given the importance of load time on conversions). Not only is their design eye-catching, their copy conveys all the potential benefits of subscribing to Hem’s newsletter. If I ever publish a book about popups, I will probably pick this one for the cover. A lot of webmasters are concerned about popups. 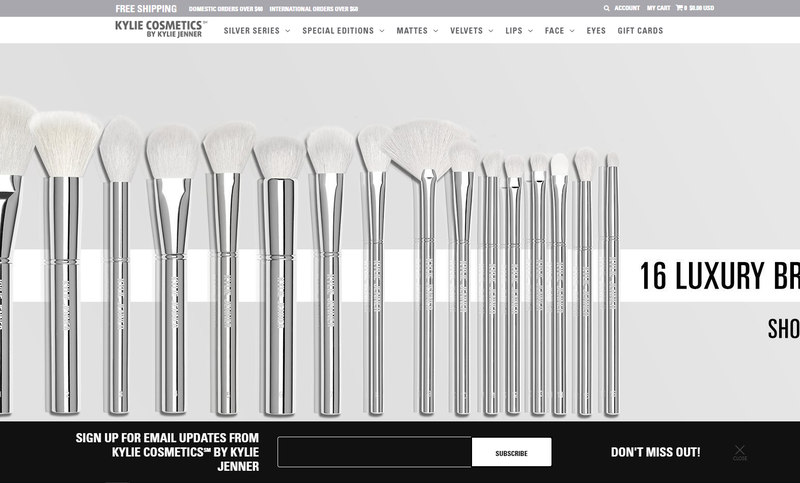 They fear it may annoy users, hurt their brand or decrease conversion rate. If that’s your case, you should like Pipcorn’s example. Displayed at the bottom-right corner of the screen, it doesn’t hide anything important on the page. A true example of what a non-intrusive popup can be. Yes, visuals can take a few milliseconds to load (we don’t have enough time to develop this topic, but please keep in mind that popups generally don’t affect your website loading time). 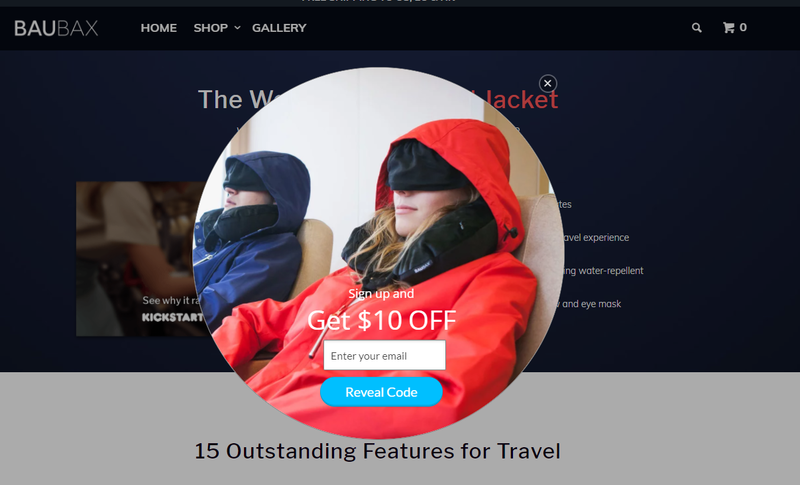 Their visual reminds us that the popup is part of the navigation experience (to put it simply, they sell swimwear and their popup features a woman in a swimsuit). Its black and white colors make it contrast with the colorful background, thus making it more visible. 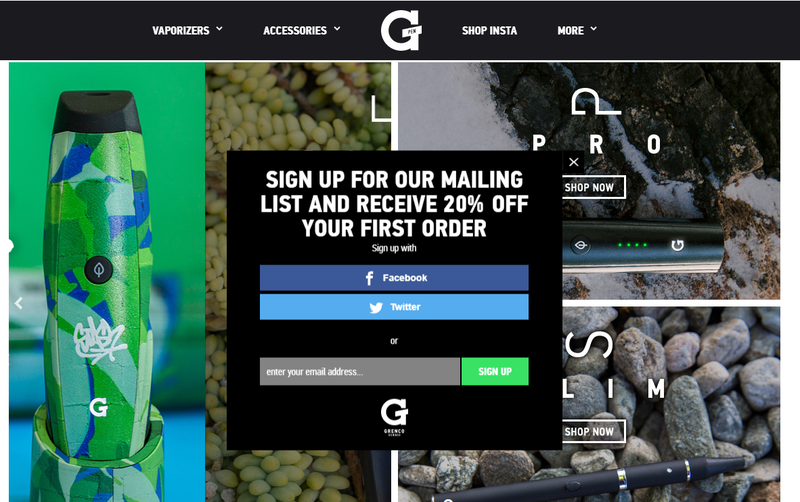 Most of the time, Shopify popups look a lot like newsletter boxes. Most of them have a square form and lack visuals. That’s why we love this rounded popup on Gaiam. The extra graphics on the border make it even more appealing. That’s what we call thinking outside the box. Again, we didn’t pick this popup because of its design. But because of the sign-up options. Grenco science offers three options to sign up: email (of course), Facebook and Twitter. I guess it couldn’t be easier for someone to sign up for their newsletter. Plus the 20% off offer can’t hurt. This is another basic popup in terms of design. 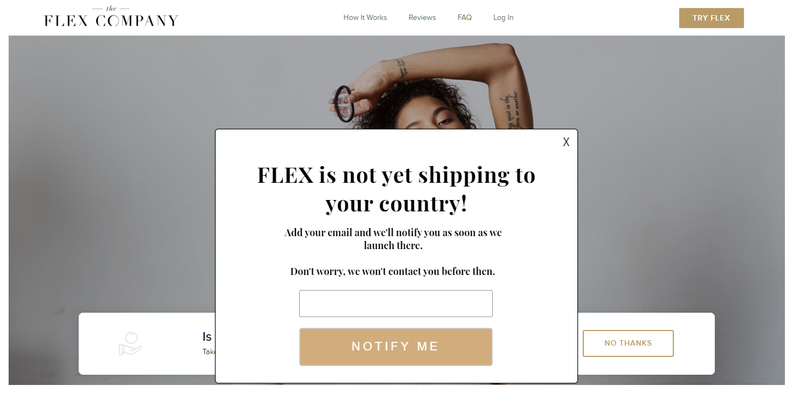 But we included it in the selection because The Flex Company is making good use of an opportunity to build their email list: foreign visitors. Instead of simply stating that the company doesn’t ship to foreign countries, it invites foreign visitors to sign up. We can assume it will make their opening in foreign countries much easier (when the time comes). Beardbrand took a very original approach to popups. Instead of displaying theirs right away or on exit like most stores do, they added an email icon with a notification. When clicked, it reveals the popup. 100% non-intrusive, and the notification style makes it almost irresistible. Plus it’s compliant with Google’s guidelines for mobile interstitials. After focusing on design and wording, let’s focus on incentives (some marketers call them lead magnets). 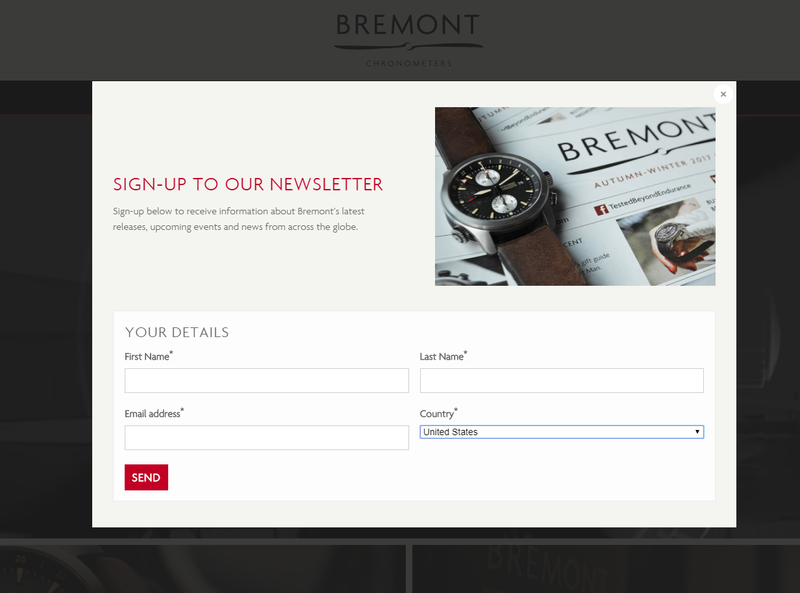 They play an important role, as most users won’t say no to an extra reason to sign up for your mailing list. And if you don’t have a budget to spend on coupons, a little creativity can help. 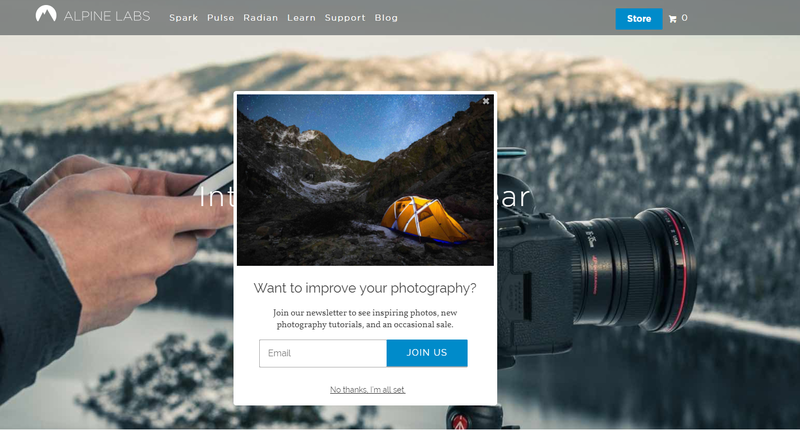 This example comes from Alpine Labs, an online store selling photo accessories. Their incentive? The promise to improve your photographer skills. It speaks well to their audience and costs them nothing). How smart! If you don’t have any content to share, sweepstakes are a good alternative. This one comes from one of the largest Shopify stores: Inkbox. It’s one of the best performing campaigns across all our customers’ accounts. See how they used a link to allow the users to close the popup instead of the traditional closing [ X ]? It helps us make sure the users have to scan the popup before they dismiss it. Sure, it’s a controversial technique (UX designers recommend using a visible way for the user to escape a modal). But it may be worth a test. If you don’t have hundreds of dollars to spend on coupons, why not offer a simple tee-shirt? It’s a bit cheap, but it works! We’ve been supplying popups to Shopify stores for more than four years. What struck us during this review is the rise of email bars. For a long time, popups were everywhere. Now it looks like a lot of websites are switching to bars. 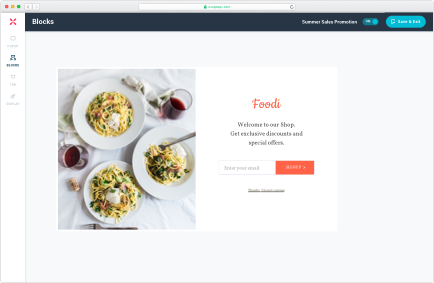 Let’s review these Shopify bar examples together. This bar design is simple. But they clearly state what the subscriber will receive (exclusive news and offers) and use the fear of missing out to perfection. As a visitor, you feel you might miss an opportunity that will not be offered again. Again, this one is pretty simple (most bars are), but the flashy background colors and the touch of humor (“this is the part where we ask for your email”) convinced us to include it in this selection. You’ll notice that this bar is positioned on top of the screen. Usually this is not a position we recommend, unless it’s displayed on all pages (which is not the case here). But its contrasted colors and humorous tone convinced us to include it. Thinx sells a product which can be hard to sell: period-proof underwear. Their unique wording turns a potentially sensitive subject into something you can laugh about. Their headline is pure genius. The simplicity of this bar makes it look extremely good on mobile devices as well. Looks like they killed two birds with one stone. Let’s finish with this MailChimp popup example. We love it, not only because we love Freddy (MailChimp’s mascot), but because of this GIF-animated background. It adds movement and life to a support that’s usually mostly static. Plus it reminds us of the animated Tattly logo. 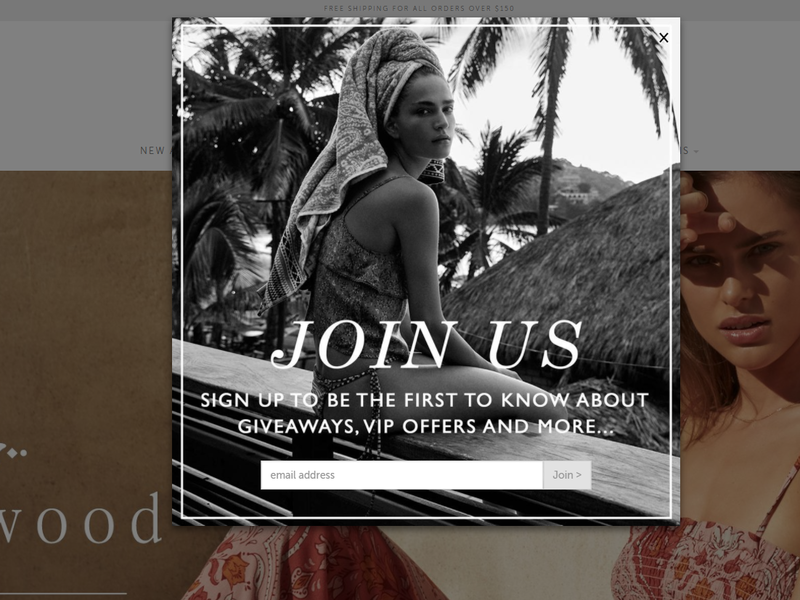 If you’re not familiar with exit popups, they’re modals displayed just before the visitor leaves a web page. Why are they worth a separate category? Because they usually differ a lot from “traditional popups” in terms of design. Since they’re displayed at the last minute, they’re usually very large to attract the user’s attention and convince her to stay. 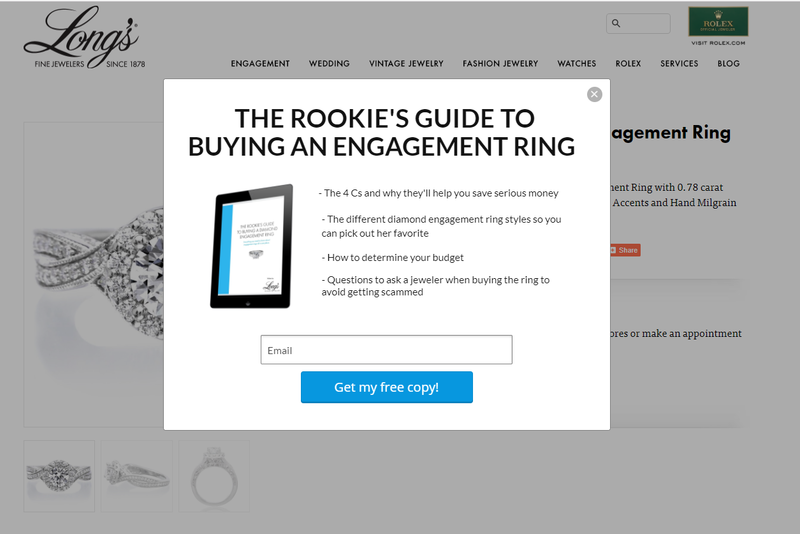 Most of the time, marketers use lightbox popups on exit, to limit distractions. True, this popup could be a simple email popup. But the lightbox effect (background is dimmed), the generous incentive and the unusual (and unmissable shape) make it an excellent example of an exit popup. Sometimes you can buy an email with a coupon. Sometimes you can simply play on the site visitors’ curiosity and their thirst for knowledge. Given Long’s Jewelers’ target–young couples about to get married–we found this lead magnet especially relevant. Well done, LJ! Here’s another good example of a lightbox popup displayed on exit. We love it because it gives two options to sign up: email AND text. Interesting! Also, the wording “Qualify” gives pause: it suggests that you’re eligible today but may not get this offer ever again. Initially, we planned to include mobile popups in this selection. After all, it all made sense: we live in a primarily mobile world. And a lot of our customers have successfully risen to the challenge. Unfortunately, we haven’t found enough good examples to include in this selection. It’s probably another sign that webmasters are still worried about getting penalized for their popups. They shouldn’t, but I guess it will take some time to convince them. If you’re interested in the topic (who wouldn’t be? ), I recommend that you read our extensive article on mobile popups. Ready to supercharge your Shopify store with popups? Give WisePops a try! We’re Shopify’s top-rated popup app. And you can test us risk-free: we offer a 14-day free trial and don’t ask for your credit card. It’s time for you to join the party!